It's Alex Kim's fourth year at Camp Lakeview, so there's nothing mysteriousabout her. 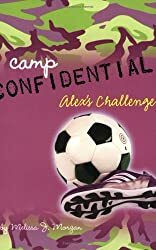 Everyone knows that she's a star athlete and an all-around leader, and if they don't, never-shy Alex will be more than happy to fill them in. But Alex is holding something back this summer, and her friends are beginning to notice. Can they figure out what's been bothering their friend before the summer ends?